The good guys over at Fuzu shared a report that they prepared based on data gathered on their platform. In case you have not heard of them, they are an internet firm that connects job seekers to jobs, and of course employers to job seekers. The data they shared covered the period between September 2015 and November 2016, where the platform handled about 4,000 open positions, with job seekers making 140,000 applications for these positions. Of these open positions, the most, 1 in every 5 vacancies (5 in every 25), were in the NGO and social world, followed by banking and insurance which fielded 16%, or about 4 for every 25% vacancies. Consulting, business support and auditing fielded 7.7% of vacancies, or about 1 in every 25 jobs. The healthcare sector closes the top 4 at 5.7%, or between 1 and 2 vacancies for every 25 open vacancies. The ICT, agriculture, and hospitality services(including restaurants) closely follow at just above 5% of vacancies each, while telecommunications, and manufacturing close the top 9 at about 4% each, or 1 in every 25 jobs. 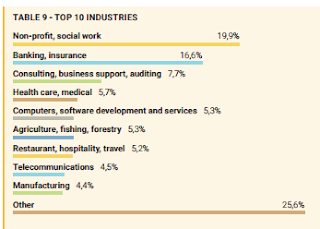 It is important to note that this data denotes sectors that were hiring the most in 2016, rather than those that have the most employees, as viewed from Fuzu’s lenses. Quite a mix, however, it appears that internships are the most popular, and the United Nations is quite a popular employer on Fuzu’s website. From the popularity of internship openings, we may therefore deduce that most of the job searchers either lack experience, or are in search of entry job positions. Indeed, looking at the work experience of the job seekers on the platform, more than half of them had 2 years or less of work experience. Shocking, is the bit that 83% of all job seekers have job experience of less than 5 years. This either means that Fuzu is frequented by many new entrants in the job market, or that many of the job seekers in the country have work experience of 5 years and below! Looking at employers’ preferences in terms of education, more than 65%, or more than half the employers prefer at least a bachelor’s degree. 3 out of 4 employers prefer a bachelor’s degree and higher, while those who hold diplomas have about 16% of the positions, or about 4 out of every 25 positions require at least a diploma. 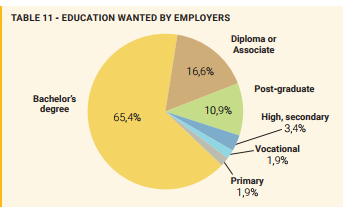 Only 1 in every 10 positions requires a postgraduate degree, which is less than the supply of postgraduate degrees. We may have to look at the cost that a postgraduate degree attracts in compensation to determine how valued these are. 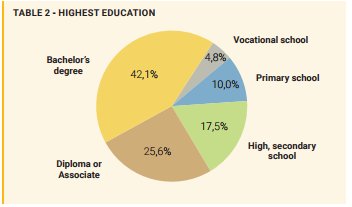 Supply wise, 42% of job seekers hold a degree, while 25% hold a diploma. In short, as a job seeker, you are better off holding a degree, the bets are in your favour, albeit slightly. 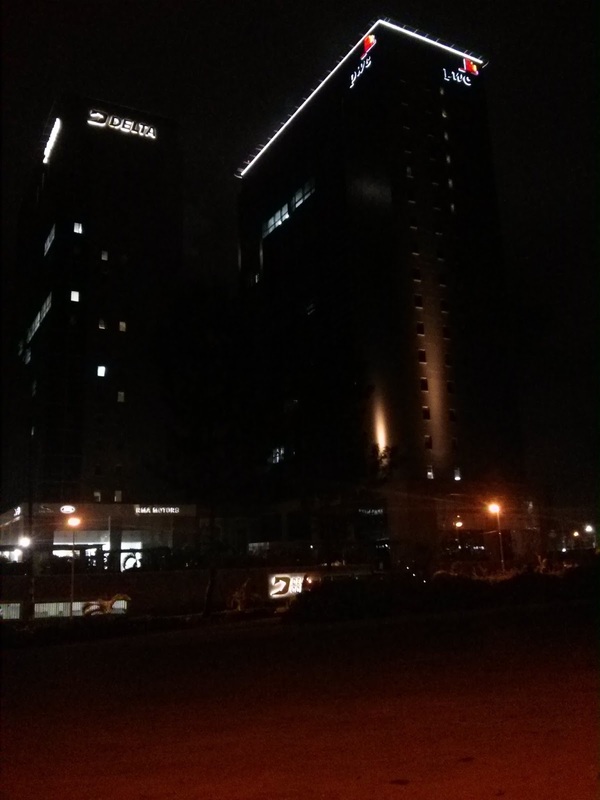 7 out of every 10 job seekers are located in Nairobi. 9 out of every 10 job seekers are located in the major urban areas of Nairobi, Eldoret, Mombasa and Nakuru. The heavy skew towards Nairobi can be explained as job seekers and employers in Nairobi been early adopters of technology. It may also mean that larger and more formal employers are found in Nairobi, hence recruitment in Nairobi is more formal. The banking sector has been hitting the headlines, yet it appears to have the second highest vacancies (together with insurance). Does this mean that banks were firing as much as they were hiring (replacing costlier employees with more affordable ones) or is that most of the hiring was in the insurance sector? There is no mandatory amount of work experience that the users should fill in, neither is there any significant reward for those who fill in a lot of information. Thus not all people might have described their full job history on their profiles (and therefore in their job applications either), and some essential data might be missing.